The End of Alchemy: Money, Banking and the Future of the Global Economy – Mervyn King. “If the economy had grown after the global financial crisis at the same rate as the number of books written about it, then we would have been back at full employment some while ago. Modern economics has encouraged ways of thinking that make crises more probable. Economists have brought the problem upon themselves by pretending that they can forecast. No one can easily predict an unknowable future, and economists are no exception. The fragility of our financial system stems directly from the fact that banks are the main source of money creation. Banks are man made institutions, important sources of innovation, prosperity and material progress, but also of greed, corruption and crises. For better or worse, they materially affect human welfare. The former governor of the Bank of England on reforming global finance. Mervyn King was governor of the Bank of England in 2003-13. In “The End of Alchemy” there is no gossip and few revelations. Instead Lord King uses his experience of the crisis as a platform from which to present economic ideas to non-specialists. He does a good job of putting complex concepts into plain English. The discussion of the evolution of money, from Roman times to 19th-century America to today, is a useful introduction for those not quite sure what currency really is. He explains why economies need central banks: at best, they are independent managers of the money supply and rein in the banking system. Central bankers like giving the impression that they have played such roles since time immemorial, but as Lord King points out the reality is otherwise. The Fed was created only in 1913; believe it or not, until 1994 it would not reveal to the public its interest rate decisions until weeks after the event. Even the Bank of England, founded in 1694, got the exclusive right to print banknotes, in England and Wales, only in 1844. At times, Lord King can be refreshingly frank. He is no fan of austerity policies, saying that they have imposed “enormous costs on citizens throughout Europe”. He also reserves plenty of criticism for the economics profession. Since forecasting is so hit and miss, he thinks, the practice of giving prizes to the best forecasters “makes as much sense as it would to award the Fields Medal in mathematics to the winner of the National Lottery”. The problem leading up to the global financial crisis, as Lord King sees it, is that commercial banks had little incentive to hold large quantities of safe, liquid assets. They knew that in a panic, the central bank would provide liquidity, no matter the quality of their balance sheets; in response they loaded up on risky investments. The past twenty years in the modern world were indeed the best of times and the worst of times. It was a tale of two epochs in the first growth and stability, followed in the second by the worst banking crisis the industrialised world has ever witnessed. Within the space of little more than a year, between August 2007 and October 2008, what had been viewed as the age of wisdom was now seen as the age of foolishness, and belief turned into incredulity. The largest banks in the biggest financial centres in the advanced world failed, triggering a worldwide collapse of confidence and bringing about the deepest recession since the 1930s. How did this happen? Was it a failure of individuals, institutions or ideas? The events of 2007-8 have spawned an outpouring of articles and books, as well as plays and films, about the crisis. If the economy had grown after the crisis at the same rate as the number of books written about it, then we would have been back at full employment some while ago. Most such accounts like the media coverage and the public debate at the time focus on the symptoms and not the underlying causes. After all, those events, vivid though they remain in the memories of both participants and spectators, comprised only the latest in a long series of financial crises since our present system of money and banking became the cornerstone of modern capitalism after the Industrial Revolution in the eighteenth century. The growth of indebtedness, the failure of banks, the recession that followed, were all signs of much deeper problems in our financial and economic system. Unless we go back to the underlying causes we will never understand what happened and will be unable to prevent a repetition and help our economies truly recover. This book looks at the big questions raised by the depressing regularity of crises in our system of money and banking. Why do they occur? Why are they so costly in terms of lost jobs and production? And what can we do to prevent them? It also examines new ideas that suggest answers. In the spring of 2011, I was in Beijing to meet a senior Chinese central banker. Over dinner in the Diaoyutai State Guesthouse, where we had earlier played tennis, we talked about the lessons from history for the challenges we faced, the most important of which was how to resuscitate the world economy after the collapse of the western banking system in 2008. Bearing in mind the apocryphal answer of Premier Chou Enlai to the question of what significance one should attach to the French Revolution (it was ‘too soon to tell’), I asked my Chinese colleague what importance he now attached to the Industrial Revolution in Britain in the second half of the eighteenth century. He thought hard. Then he replied: ‘We in China have learned a great deal from the West about how competition and a market economy support industrialisation and create higher living standards. We want to emulate that.’ Then came the sting in the tail, as he continued: ‘But I don’t think you’ve quite got the hang of money and banking yet.’ His remark was the inspiration for this book. Since the crisis, many have been tempted to play the game of deciding who was to blame for such a disastrous outcome. But blaming individuals is counterproductive, it leads you to think that if just a few, or indeed many, of those people were punished then we would never experience a crisis again. If only it were that simple. A generation of the brightest and best were lured into banking, and especially into trading, by the promise of immense financial rewards and by the intellectual challenge of the work that created such rich returns. They were badly misled. The crisis was a failure of a system, and the ideas that underpinned it, not of individual policy makers or bankers, incompetent and greedy though some of them undoubtedly were. There was a general misunderstanding of how the world economy worked. Given the size and political influence of the banking sector, is it too late to put the genie back in the bottle? No it is never too late to ask the right questions, and in this book I try to do so. If we don’t blame the actors, then why not the playwright? Economists have been cast by many as the villain. An abstract and increasingly mathematical discipline, economics is seen as having failed to predict the crisis. This is rather like blaming science for the occasional occurrence of a natural disaster. Yet we would blame scientists if incorrect theories made disasters more likely or created a perception that they could never occur, and one of the arguments of this book is that economics has encouraged ways of thinking that made crises more probable. Economists have brought the problem upon themselves by pretending that they can forecast. No one can easily predict an unknowable future, and economists are no exception. Despite the criticism, modern economics provides a distinctive and useful way of thinking about the world. But no subject can stand still, and economics must change, perhaps quite radically, as a result of the searing experience of the crisis. A theory adequate for today requires us to think for ourselves, standing on the shoulders of giants of the past, not kneeling in front of them. Economies that are capable of sending men to the moon and producing goods and services of extraordinary complexity and innovation seem to struggle with the more mundane challenge of handling money and banking. The frequency, and certainly severity, of crises has, if anything, increased rather than decreased over time. In the heat of the crisis in October 2008, nation states took over responsibility for all the obligations and debts of the global banking system. In terms of its balance sheet, the banking system had been virtually nationalised but without collective control over its operations. That government rescue cannot conveniently be forgotten. When push came to shove, the very sector that had espoused the merits of market discipline was allowed to carry on only by dint of taxpayer support. The creditworthiness of the state was put on the line, and in some cases, such as Iceland and Ireland, lost. God may have created the universe, but we mortals created paper money and risky banks. They are man made institutions, important sources of innovation, prosperity and material progress, but also of greed, corruption and crises. For better or worse, they materially affect human welfare. For much of modern history, and for good reason, money and banking have been seen as the magical elements that liberated us from a stagnant feudal system and permitted the emergence of dynamic markets capable of making the long-term investments necessary to support a growing economy. The idea that paper money could replace intrinsically valuable gold and precious metals, and that banks could take secure short-term deposits and transform them into long-term risky investments, came into its own with the Industrial Revolution in the eighteenth century. It was both revolutionary and immensely seductive. It was in fact financial alchemy, the creation of extraordinary financial powers that defy reality and common sense. Pursuit of this monetary elixir has brought a series of economic disasters from hyperinflations to banking collapses. Why have money and banking, the alchemists of a market economy, turned into its Achilles heel? The purpose of this book is to answer that question. It sets out to explain why the economic failures of a modern capitalist economy stem from our system of money and banking, the consequences for the economy as a whole, and how we can end the alchemy. Our ideas about money and banking are just as much a product of our age as the way we conduct our politics and imagine our past. The twentieth century experience of depression, hyperinflation and war changed both the world and the way economists thought about it. Before the Great Depression of the early 1930s, central banks and governments saw their role as stabilising the financial system and balancing the budget. After the Great Depression, attention turned to policies aimed at maintaining full employment. But post-war confidence that Keynesian ideas, the use of public spending to expand total demand in the economy, would prevent us from repeating the errors of the past was to prove touchingly naive. The use of expansionary policies during the 1960s, exacerbated by the Vietnam War, led to the Great Inflation of the 1970s, accompanied by slow growth and rising unemployment, the combination known as ‘stagflation’. The direct consequence was that central banks were reborn as independent institutions committed to price stability. So successful was this that in the 1990s not only did inflation fall to levels unseen for a generation, but central banks and their governors were hailed for inaugurating an era of economic growth with low inflation, the Great Stability or Great Moderation. Politicians worshipped at the altar of finance, bringing gifts in the form of lax regulation and receiving support, and sometimes campaign contributions, in return. Then came the fall: the initial signs that some banks were losing access to markets for short-term borrowing in 2007, the collapse of the industrialised world’s banking system in 2008, the Great Recession that followed, and increasingly desperate attempts by policy-makers to engineer a recovery. Today the world economy remains in a depressed state. Enthusiasm for policy stimulus is back in fashion, and the wheel has turned full circle. The recession is hurting people who were not responsible for our present predicament, and they are, naturally, angry. There is a need to channel that anger into a careful analysis of what went wrong and a determination to put things right. The economy is behaving in ways that we did not expect, and new ideas will be needed if we are to prevent a repetition of the Great Recession and restore prosperity. Many accounts and memoirs of the crisis have already been published. Their titles are numerous, but they share the same invisible subtitle: ‘how I saved the world’. So although in the interests of transparency I should make clear that I was an actor in the drama, Governor of the Bank of England for ten years between 2003 and 2013, during both the Great Stability, the banking crisis itself, the Great Recession that followed, and the start of the recovery, this is not a memoir of the crisis with revelations about private conversations and behind the scenes clashes. Of course, those happened as in any walk of life. But who said what to whom and when can safely, and properly, be left to dispassionate and disinterested historians who can sift and weigh the evidence available to them after sufficient time has elapsed and all the relevant official and unofficial papers have been made available. Instant memoirs, whether of politicians or officials, are usually partial and self-serving. I see little purpose in trying to set the record straight when any account that I gave would naturally also seem self-serving. My own record of events and the accompanying Bank papers will be made available to historians when the twenty-year rule permits their release. This book is about economic ideas. My time at the Bank of England showed that ideas, for good or ill, do influence governments and their policies. The adoption of inflation targeting in the early 1990s and the granting of independence to the Bank of England in 1997 are prime examples. Economists brought intellectual rigour to economic policy and especially to central banking. But my experience at the Bank also revealed the inadequacies of the ‘models’, whether verbal descriptions or mathematical equations, used by economists to explain swings in total spending and production. In particular, such models say nothing about the importance of money and banks and the panoply of financial markets that feature prominently in newspapers and on our television screens. Is there a fundamental weakness in the intellectual economic framework underpinning contemporary thinking? An exploration of some of these basic issues does not require a technical exposition, and I have stayed away from one. Of course, economists use mathematical and statistical methods to understand a complex world, they would be remiss if they did not. Economics is an intellectual discipline that requires propositions to be not merely plausible but subject to the rigour of a logical proof. And yet there is no mathematics in this book. It is written in (I hope) plain English and draws on examples from real life. Although I would like my fellow economists to read the book in the hope that they will take forward some of the ideas presented here, it is aimed at the reader with no formal training in economics but an interest in the issues. In the course of this book, I will explain the fundamental causes of the crisis and how the world economy lost its balance; how money emerged in earlier societies and the role it plays today; why the fragility of our financial system stems directly from the fact that banks are the main source of money creation; why central banks need to change the way they respond to crises; why politics and money go hand in hand; why the world will probably face another crisis unless nations pursue different policies; and, most important of all, how we can end the alchemy of our present system of money and banking. By alchemy I mean the belief that all paper money can be turned into an intrinsically valuable commodity, such as gold, on demand and that money kept in banks can be taken out whenever depositors ask for it. The truth is that money, in all forms, depends on trust in its issuer. Confidence in paper money rests on the ability and willingness of governments not to abuse their power to print money. Bank deposits are backed by long-term risky loans that cannot quickly be converted into money. For centuries, alchemy has been the basis of our system of money and banking. As this book shows, we can end the alchemy without losing the enormous benefits that money and banking contribute to a capitalist economy. Four concepts are used extensively in the book: disequilibrium, radical uncertainty, the prisoner’s dilemma and trust. These concepts will be familiar to many, although the context in which I use them may not. Their significance will become clear as the argument unfolds, but a brief definition and explanation may be helpful at the outset. Disequilibrium is the absence of a state of balance between the forces acting on a system. As applied to economics, disequilibrium is a position that is unsustainable, meaning that at some point a large change in the pattern of spending and production will take place as the economy moves to a new equilibrium. The word accurately describes the evolution of the world economy since the fall of the Berlin Wall, which I discuss in Chapter 1. Radical uncertainty refers to uncertainty so profound that it is impossible to represent the future in terms of a knowable and exhaustive list of outcomes to which we can attach probabilities. Economists conventionally assume that ‘rational’ people can construct such probabilities. But when businesses invest, they are not rolling dice with known and finite outcomes on the faces; rather they face a future in which the possibilities are both limitless and impossible to imagine. Almost all the things that define modern life, and which we now take for granted, such as cars, aeroplanes, computers and antibiotics, were once unimaginable. The essential challenge facing everyone living in a capitalist economy is the inability to conceive of what the future may hold. The failure to incorporate radical uncertainty into economic theories was one of the factors responsible for the misjudgements that led to the crisis. The prisoner’s dilemma may be defined as the difficulty of achieving the best outcome when there are obstacles to cooperation. Imagine two prisoners who have been arrested and kept apart from each other. Both are offered the same deal: if they agree to incriminate the other they will receive a light sentence, but if they refuse to do so they will receive a severe sentence if the other incriminates them. If neither incriminates the other, then both are acquitted. Clearly, the best outcome is for both to remain silent. But if they cannot cooperate the choice is more difficult. The only way to guarantee the avoidance of a severe sentence is to incriminate the other. And if both do so, the outcome is that both receive a light sentence. But this non-cooperative outcome is inferior to the cooperative outcome. The difficulty of cooperating with each other creates a prisoner’s dilemma. Such problems are central to understanding how the economy behaves as a whole (the field known as macroeconomics) and to thinking through both how we got into the crisis and how we can now move towards a sustainable recovery. Many examples will appear in the following pages. Finding a resolution to the prisoner’s dilemma problem in a capitalist economy is central to understanding and improving our fortunes. Those four ideas run through the book and help us to understand the origin of the alchemy of money and banking and how we can reduce or even eliminate that alchemy. When I left the Bank of England in 2013, I decided to explore the flaws in both the theory and practice of money and banking, and how they relate to the economy as a whole. I was led deeper and deeper into basic questions about economics. I came to believe that fundamental changes are needed in the way we think about macroeconomics, as well as in the way central banks manage their economies. A key role of a market economy is to link the present and the future, and to coordinate decisions about spending and production not only today but tomorrow and in the years thereafter. Families will save if the interest rate is high enough to overcome their natural impatience to spend today rather than tomorrow. Companies will invest in productive capital if the prospective rate of return exceeds the cost of attracting finance. And economic growth requires saving and investment to add to the stock of productive capital and so increase the potential output of the economy in the future. In a healthy growing economy all three rates, the interest rate on saving, the rate of return on investment, and the rate of growth are well above zero. Today, however, we are stuck with extraordinarily low interest rates, which discourage saving, the source of future demand and, if maintained indefinitely, will pull down rates of return on investment, diverting resources into unprofitable projects. Both effects will drag down future growth rates. We are already some way down that road. It seems that our market economy today is not providing an effective link between the present and the future. I believe there are two reasons for this failure. First, there is an inherent problem in linking a known present with an unknowable future. Radical uncertainty presents a market economy with an impossible challenge how are we to create markets in goods and services that we cannot at present imagine? Money and banking are part of the response of a market economy to that challenge. Second, the conventional wisdom of economists about how governments and central banks should stabilise the economy gives insufficient weight to the importance of radical uncertainty in generating an occasional large disequilibrium. Crises do not come out of thin air but are the result of the unavoidable mistakes made by people struggling to cope with an unknowable future. Both issues have profound implications and will be explored at greater length in subsequent chapters. Inevitably, my views reflect the two halves of my career. The first was as an academic, a student in Cambridge, England, and a Kennedy scholar at Harvard in the other Cambridge, followed by teaching positions on both sides of the Atlantic. I experienced at first hand the evolution of macroeconomics from literary exposition where propositions seemed plausible but never completely convincing, into a mathematical discipline where propositions were logically convincing but never completely plausible. Only during the crisis of 2007-9 did I look back and understand the nature of the tensions between the surviving disciples of John Maynard Keynes who taught me in the 1960s, primarily Richard Kahn and Joan Robinson, and the influx of mathematicians and scientists into the subject that fuelled the rapid expansion of university economics departments in the same period. The old school ‘Keynesians’ were mistaken in their view that all wisdom was to be found in the work of one great man, and as a result their influence waned. The new arrivals brought mathematical discipline to a subject that prided itself on its rigour. But the informal analysis of disequilibrium of economies, radical uncertainty, and trust as a solution to the prisoner’s dilemma was lost in the enthusiasm for the idea that rational individuals would lead the economy to an efficient equilibrium. It is time to take those concepts more seriously. The second half of my career comprised twenty-two years at the Bank of England, the oldest continuously functioning central bank in the world, from 1991 to 2013, as Chief Economist, Deputy Governor and then Governor. That certainly gave me a chance to see how money could be managed. I learned, and argued publicly, that this is done best not by relying on gifted individuals to weave their magic, but by designing and building institutions that can be run by people who are merely professionally competent. Of course individuals matter and can make a difference, especially in a crisis. But the power of markets, the expression of hundreds of thousands of investors around the world is a match for any individual, central banker or politician, who fancies his ability to resist economic arithmetic. As one of President Clinton’s advisers remarked, ‘I used to think if there was reincarnation, I wanted to come back as the president or the Pope or a .400 baseball hitter. But now I want to come back as the bond market. You can intimidate everybody.’ Nothing has diminished the force of that remark since it was made over twenty years ago. In 2012, I gave the first radio broadcast in peacetime by a Governor of the Bank of England since Montagu Norman delivered a talk on the BBC in March 1939, only months before the outbreak of the Second World War. As Norman left Broadcasting House, he was mobbed by British Social Credits Party demonstrators carrying flags and slogan-boards bearing the words: CONSCRIPT THE BANKERS FIRST! Feelings also ran high in 2012. The consequences of the events of 2007-9 are still unfolding, and anger about their effects on ordinary citizens is not diminishing. That disaster was a long time in the making, and will be just as long in the resolving. But the cost of lost output and employment from our continuing failure to manage money and banking and prevent crises is too high for us to wait for another crisis to occur before we act to protect future generations. Charles Dickens’ novel A Tale of Two Cities has not only a very famous opening sentence but an equally famous closing sentence. As Sydney Carton sacrifices himself to the guillotine in the place of another, he reflects: ‘It is a far, far better thing that I do, than I have ever done …’ If we can find a way to end the alchemy of the system of money and banking we have inherited then, at least in the sphere of economics, it will indeed be a far, far better thing than we have ever done. History is what happened before you were born. That is why it is so hard to learn lessons from history: the mistakes were made by the previous generation. As a student in the 1960s, I knew why the 1930s were such a bad time. Outdated economic ideas guided the decisions of governments and central banks, while the key individuals were revealed in contemporary photographs as fuddy-duddies who wore whiskers and hats and were ignorant of modern economics. A younger generation, in academia and government, trained in modern economics, would ensure that the Great Depression of the 1930s would never be repeated. In the 1960s, everything seemed possible. Old ideas and conventions were jettisoned, and a new world beckoned. In economics, an influx of mathematicians, engineers and physicists brought a new scientific approach to what the nineteenth-century philosopher and writer Thomas Carlyle christened the ‘dismal science’. It promised not just a better understanding of our economy, but an improved economic performance. The subsequent fifty years were a mixed experience. Over that period, national income in the advanced world more than doubled, and in the so-called developing world hundreds of millions of people were lifted out of extreme poverty. And yet runaway inflation in the 1970s was followed in 2007-9 by the biggest financial crisis the world has ever seen. How do we make sense of it all? Was the post-war period a success or a failure? The history of capitalism is one of growth and rising living standards interrupted by financial crises, most of which have emanated from our mismanagement of money and banking. My Chinese colleague spoke an important, indeed profound, truth. The financial crisis of 2007-9 (hereafter ‘the crisis’) was not the fault of particular individuals or economic policies. Rather, it was merely the latest manifestation of our collective failure to manage the relationship between finance, the structure of money and banking, and a capitalist system. Failure to appreciate this explains why most accounts of the crisis focus on the symptoms and not the underlying causes of what went wrong. The fact that we have not yet got the hang of it does not mean that a capitalist economy is doomed to instability and failure. It means that we need to think harder about how to make it work. Over many years, a capitalist economy has proved the most successful route to escape poverty and achieve prosperity. Capitalism, as I use the term here, is an economic system in which private owners of capital hire wage earners to work in their businesses and pay for investment by raising finance from banks and financial markets. The West has built the institutions to support a capitalist system, the rule of law to enforce private contracts and protect property rights, intellectual freedom to innovate and publish new ideas, anti-trust regulation to promote competition and break up monopolies, and collectively financed services and networks, such as education, water, electricity and telecommunications, which provide the infrastructure to support a thriving market economy. Those institutions create a balance between freedom and restraint, and between unfettered competition and regulation. It is a subtle balance that has emerged and evolved over time. And it has transformed our standard of living. Growth at a rate of 2.5 per cent a year, close to the average experienced in North America and Europe since the Second World War, raises real total national income twelvefold over one century, a truly revolutionary outcome. A workman could scarce, perhaps, with his utmost industry, make one pin in a day, and certainly could not make twenty. But in the way in which this business is now carried on, not only the whole work is a peculiar trade, but it is divided into a number of branches. One man draws out the wire, another straights it, a third cuts it, a fourth points it, a fifth grinds it at the top for receiving the head The important business of making a pin is, in this manner, divided into about eighteen distinct operations, which, in some manufactories, are all performed by distinct hands. The factory Smith was describing employed ten men and made over 48,000 pins in a day. The application of technical knowhow to more and more tasks increased specialisation and raised productivity. Specialisation went hand in hand with an even greater need for both a means to exchange the fruits of one’s labour for an ever wider variety of goods produced by other specialists, money, and a way to finance the purchase of the capital equipment that made specialisation possible, banks. As each person in the workforce became more specialised, more machinery and capital investment was required to support them, and the role of money and banks increased. After a millennium of roughly constant output per person, from the middle of the eighteenth century productivity started, slowly but surely, to rise. Capitalism was, quite literally, producing the goods. Historians will continue to debate why the Industrial Revolution occurred in Britain, population growth, plentiful supplies of coal and iron, supportive institutions, religious beliefs and other factors all feature in recent accounts. But the evolution of money and banking was a necessary condition for the Revolution to take off. Almost a century later, with the experience of industrialisation and a massive shift of labour from the land to urban factories, socialist writers saw things differently. For Karl Marx and Friedrich Engels the future was clear. Capitalism was a temporary staging post along the journey from feudalism to socialism. In their Communist Manifesto of 1848, they put forward their idea of ‘scientific socialism’ with its deterministic view that capitalism would ultimately collapse and be replaced by socialism or communism. Later, in the first volume of Das Kapital (1867), Marx elaborated (at great length) on this thesis and predicted that the owners of capital would become ever richer while excessive capital accumulation would lead to a falling rate of profit, reducing the incentive to invest and leaving the working class immersed in misery. The British industrial working class in the nineteenth century did indeed suffer miserable working conditions, as graphically described by Charles Dickens in his novels. But no sooner had the ink dried on Marx’s famous work than the British economy entered a long period of rising real wages (money wages adjusted for the cost of living). Even the two world wars and the intervening Great Depression in the 1930s could not halt rising productivity and real wages, and broadly stable rates of profit. Economic growth and improving living standards became the norm. But if capitalism did not collapse under the weight of its own internal contradictions, neither did it provide economic security. During the twentieth century, the extremes of hyperinflations and depressions eroded both living standards and the accumulated wealth of citizens in many capitalist economies, especially during the Great Depression in the 1930s, when mass unemployment sparked renewed interest in the possibilities of communism and central planning, especially in Europe. The British economist John Maynard Keynes promoted the idea that government intervention to bolster total spending in the economy could restore full employment, without the need to resort to fully fledged socialism. After the Second World War, there was a widespread belief that government planning had won the war and could be the means to win the peace. In Britain, as late as 1964 the newly elected Labour government announced a ‘National Plan’. Inspired by a rather naive version of Keynesian ideas, it focused on policies to boost the demand for goods and services rather than the ability of the economy to produce them. As the former outstripped the latter, the result was inflation. On the other side of the Atlantic, the growing cost of the Vietnam War in the late 1960s also led to higher inflation. Rising inflation put pressure on the internationally agreed framework within which countries had traded with each other since the Bretton Woods Agreement of 1944, named after the conference held in the New Hampshire town in July of that year. Designed to allow a war-damaged Europe slowly to rebuild its economy and reintegrate into the world trading system, the agreement created an international monetary system under which countries set their own interest rates but fixed their exchange rates among themselves. For this to be possible, movements of capital between countries had to be severely restricted otherwise capital would move to where interest rates were highest, making it impossible to maintain either differences in those rates or fixed exchange rates. Exchange controls were ubiquitous, and countries imposed limits on investments in foreign currency. As a student, I remember that no British traveller in the 1960s could take abroad with them more than £50 a year to spend. The new international institutions, the International Monetary Fund (IMF) and the World Bank, would use funds provided by its members to finance temporary shortages of foreign currency and the investment needed to replace the factories and infrastructure destroyed during the Second World War. Implicit in this framework was the belief that countries would have similar and low rates of inflation. Any loss of competitiveness in one country, as a result of higher inflation than in its trading partners, was assumed to be temporary and would be met by a deflationary policy to restore competitiveness while borrowing from the IMF to finance a short-term trade deficit. But in the late 1960s differences in inflation across countries, especially between the United States and Germany, appeared to be more than temporary, and led to the breakdown of the Bretton Woods system in 1970-1. By the early 1970s, the major economies had moved to a system of ‘floating’ exchange rates, in which currency values are determined by private sector supply and demand in the markets for foreign exchange. Inevitably, the early days of floating exchange rates reduced the discipline on countries to pursue low inflation. When the two oil shocks of the 1970s, in 1973, when an embargo by Arab countries led to a quadrupling of prices, and 1979, when prices doubled after disruption to supply following the Iranian Revolution hit the western world, the result was the Great Inflation, with annual inflation reaching 13 per cent in the United States and 27 per cent in the United Kingdom. From the late 1970s onwards, the western world then embarked on what we can now see were three bold experiments to manage money, exchange rates and the banking system better. The first was to give central banks much greater independence in order to bring down and stabilise inflation, subsequently enshrined in the policy of inflation targeting, the goal of national price stability. The second was to allow capital to move freely between countries and encourage a shift to fixed exchange rates both within Europe, culminating in the creation of a monetary union, and in a substantial proportion of the most rapidly growing part of the world economy, particularly China, which fixed its exchange rates against the US dollar, the goal of exchange rate stability. And the third experiment was to remove regulations limiting the activities of the banking and financial system to promote competition and allow banks both to diversify into new products and regions and to expand in size, with the aim of bringing stability to a banking system often threatened in the past by risks that were concentrated either geographically or by line of business, the goal of financial stability. These three simultaneous experiments might now be best described as having three consequences the Good, the Bad and the Ugly. The Good was a period between about 1990 and 2007 of unprecedented stability of both output and inflation the Great Stability. Monetary policy around the world changed radically. Inflation targeting and central bank independence spread to more than thirty countries. And there were significant changes in the dynamics of inflation, which on average became markedly lower, less variable and less persistent. The Bad was the rise in debt levels. Eliminating exchange rate flexibility in Europe and the emerging markets led to growing trade surpluses and deficits. Some countries saved a great deal while others had to borrow to finance their external deficit. The willingness of the former to save outweighed the willingness of the latter to spend, and so long-term interest rates in the integrated world capital market began to fall. The price of an asset, whether a house, shares in a company or any other claim on the future, is the value today of future expected returns (rents, the value of housing services from living in your own home, or dividends). To calculate that price one must convert future into current values by discounting them at an interest rate. The immediate effect of a fall in interest rates is to raise the prices of assets across the board. So as long-term interest rates in the world fell, the value of assets especially of houses rose. And as the values of assets increased, so did the amounts that had to be borrowed to enable people to buy them. Between 1986 and 2006, household debt rose from just under 70 per cent of total household income to almost 120 per cent in the United States and from 90 per cent to around 140 per cent in the United Kingdom. The Ugly was the development of an extremely fragile banking system. In the USA, Federal banking regulators’ increasingly lax interpretation of the provisions to separate commercial and investment banking introduced in the 1933 Banking Act (often known as Glass-Steagall, the senator and representative respectively who led the passage of the legislation) reached its inevitable conclusion with the Gramm-Leach-Bliley Act of 1999, which swept away any remaining restrictions on the activities of banks. In the UK, the so-called Big Bang of 1986, which started as a measure to introduce competition into the Stock Exchange, led to takeovers of small stockbroking firms and mergers between commercial banks and securities houses. Banks diversified and expanded rapidly after deregulation. In continental Europe so-called universal banks had long been the norm. The assets of large international banks doubled in the five years before 2008. Trading of new and highly complex financial products among banks meant that they became so closely interconnected that a problem in one would spread rapidly to others, magnifying rather than spreading risk. Banks relied less and less on their own resources to finance lending and became more and more dependent on borrowing. The equity capital of banks, the funds provided by the shareholders of the bank accounted for a declining proportion of overall funding. Leverage, the ratio of total assets (or liabilities) to the equity capital of a bank, rose to extraordinary levels. On the eve of the crisis, the leverage ratio for many banks was 30 or more, and for some investment banks it was between 40 and 50. A few banks had ratios even higher than that. With a leverage ratio of even 25 it would take a fall of only 4 per cent in the average value of a bank’s assets to wipe out the whole of the shareholders’ equity and leave it unable to service its debts. By 2008, the Ugly led the Bad to overwhelm the Good. The crisis, one might say catastrophe of the events that began to unfold under the gaze of a disbelieving world in 2007, was the failure of all three experiments. Greater stability of output and inflation, although desirable in itself, concealed the build-up of a major disequilibrium in the composition of spending. Some countries were saving too little and borrowing too much to be able to sustain their path of spending in the future, while others saved and lent so much that their consumption was pushed below a sustainable path. Total saving in the world was so high that interest rates, after allowing for inflation, fell to levels incompatible in the long run with a profitable growing market economy. Falling interest rates led to rising asset values and increases in the debt taken out against those more valuable assets. Fixed exchange rates exacerbated the burden of the debts, and in Europe the creation of monetary union in 1999 sapped the strength of many of its economies, as they became increasingly uncompetitive. Large, highly leveraged banks proved unstable and were vulnerable to even a modest loss of confidence, resulting in contagion to other banks and the collapse of the system in 2008. At their outset the ill-fated nature of the three experiments was not yet visible. On the contrary, during the 1990s the elimination of high and variable inflation, which had undermined market economies in the 1970s, led to a welcome period of macroeconomic stability. The Great Stability, or the Great Moderation as it was dubbed in the United States, was seen, as in many ways it was, as a success for monetary policy. But it was unsustainable. Policy-makers were conscious of problems inherent in the first two experiments, but seemed powerless to do anything about them. At international gatherings, such as those of the IMF, policy-makers would wring their hands about the ‘global imbalances’ but no one country had any incentive to do anything about it. If a country had, on its own, tried to swim against the tide of falling interest rates, it would have experienced an economic slowdown and rising unemployment without any material impact on either the global economy or the banking system. Even then the prisoner’s dilemma was beginning to rear its ugly head. Nor was it obvious how the unsustainable position of the world economy would come to an end. I remember attending a seminar of economists and policy-makers at the IMF as early as 2002 where the consensus was that there would eventually be a sharp fall in the value of the US dollar, which would produce a change in spending patterns. But long before that could happen, the third experiment ended with the banking crisis of September and October 2008. The shock that some of the biggest and most successful commercial banks in North America and Europe either failed, or were seriously crippled, led to a collapse of confidence which produced the largest fall in world trade since the 1930s. Something had gone seriously wrong. Opinions differ as to the cause of the crisis. Some see it as a financial panic in which fundamentally sound financial institutions were left short of cash as confidence in the credit-worthiness of banks suddenly changed and professional investors stopped lending to them, a liquidity crisis. Others see it as the inevitable outcome of bad lending decisions by banks, a solvency crisis, in which the true value of banks’ assets had fallen by enough to wipe out most of their equity capital, meaning that they might be unable to repay their debts. But almost all accounts of the recent crisis are about the symptoms, the rise and fall of housing markets, the explosion of debt and the excesses of the banking system rather than the underlying causes of the events that overwhelmed the economies of the industrialised world in 2008. Some even imagine that the crisis was solely an affair of the US financial sector. But unless the events of 2008 are seen in their global economic context, it is hard to make sense of what happened and of the deeper malaise in the world economy. The story of what happened can be explained in little more than a few pages, everything you need to know but were afraid to ask about the causes of the recent crisis. So here goes. By the start of the twenty-first century it seemed that economic prosperity and democracy went hand in hand. Modern capitalism spawned growing prosperity based on growing trade, free markets and competition, and global banks. In 2008 the system collapsed. To understand why the crisis was so big, and came as such a surprise, we should start at the key turning point, the fall of the Berlin Wall in 1989. At the time it was thought to represent the end of communism, indeed the end of the appeal of socialism and central planning. For some it was the end of history. For most, it represented a victory for free market economics. Contrary to the prediction of Marx, capitalism had displaced communism. Yet who would have believed that the fall of the Wall was not just the end of communism but the beginning of the biggest crisis in capitalism since the Great Depression? What has happened over the past quarter of a century to bring about this remarkable change of fortune in the position of capitalist economies? After the demise of the socialist model of a planned economy, China, countries of the former Soviet Union and India embraced the international trading system, adding millions of workers each year to the pool of labour around the world producing tradeable, especially manufactured, goods. In China alone, over 70 million manufacturing jobs were created during the twenty-first century, far exceeding the 42 million working in manufacturing in 2012 in the United States and Europe combined. The pool of labour supplying the world trading system more than trebled in size. Advanced economies benefited from an influx of cheap consumer goods at the expense of employment in the manufacturing sector. The aim of the emerging economies was to follow Japan and Korea in pursuing an export-led growth strategy. To stimulate exports, their exchange rates were held down by fixing them at a low level against the US dollar. The strategy worked, especially in the case of China. Its share in world exports rose from 2 per cent to 12 per cent between 1990 and 2013. China and other Asian economies ran large trade surpluses. In other words, they were producing more than they were spending and saving more than they were investing at home. The desire to save was very strong. In the absence of a social safety net, households in China chose to save large proportions of their income to provide self-insurance in the event of unemployment or ill-health, and to finance retirement consumption. Such a high level of saving was exacerbated by the policy from 1980 of limiting most families to one child, making it difficult for parents to rely on their children to provide for them in retirement. Asian economies in general also saved more in order to accumulate large holdings of dollars as insurance in case their banking system ran short of foreign currency, as happened to Korea and other countries in the Asian financial crisis of the 1990s. Banks create money from nothing. And it gets worse – Jackson Stiles. Richard Werner, the German professor famous for inventing the term ‘quantitative easing’, says the world is finally waking up to the fact that “banks create money out of nothing” – but warns this realisation has given rise to a new “Orwellian” threat. Professor Werner says the recent campaigns around the world, including in India and Australia, to get rid of cash are coordinated attempts by central bankers to monopolise money creation. 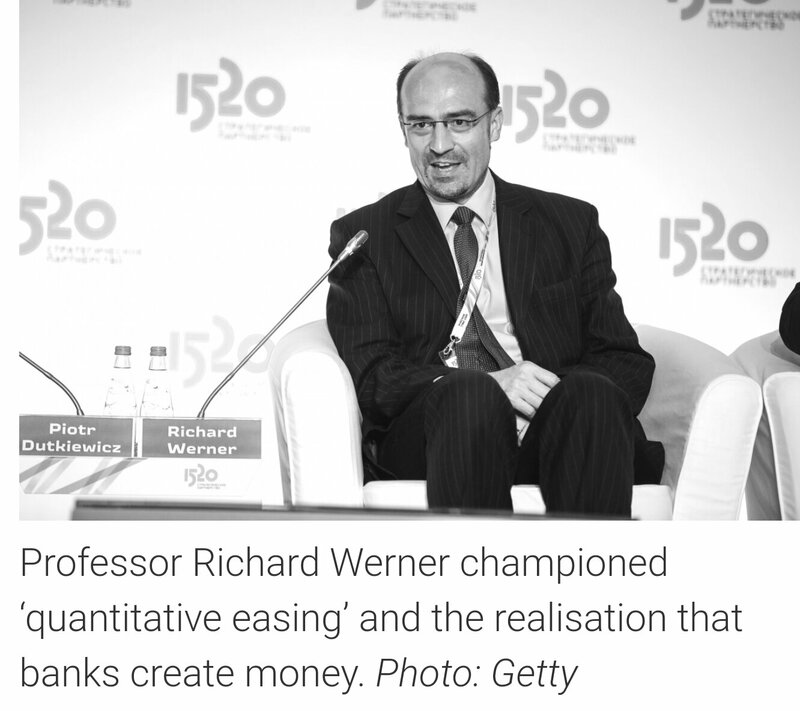 Professor Werner (pronounced ‘Verner’), currently the Chair of International Banking at the University of Southampton, is one of the first academics in the world to bring attention to the fact that banks loan money into existence. He has been arguing this for more than two decades, and has published several papers on the subject. Two Australian economists, Steve Keen and Bill Mitchell, have also led the charge. The old theory, taught in high school economics classes and to university undergrads, is that banks receive deposits and loan out of a percentage of that money, while keeping some in reserve. The truth, according to Professor Werner, is closer to the following: A bank receives $100 from a depositor, keeps that $100 in reserve, and then creates $9900 worth of new loans and deposits. It may also create $15,000 in new deposits through its lending. This is a rough approximation. The main point is that the banks do not lend existing money, but add to deposits and the money supply when they ‘lend’. And when those loans are repaid, money is removed from circulation. Thus, the supply of money is constantly being expanded and contracted by banks – which may explain why the ‘credit crunch’ of the global financial crisis was so devastating. Banks weren’t lending, so there was a shortage of money. By some estimates, the banks create upwards of 97 per cent of money, in the form of electronic funds stored in online accounts. Banknotes and coins? They are just tokens of value, printed to represent the money already created by banks. Most of the money in circulation is electronic, and created by banks. It is not in banknotes or coins. This theory is now widely accepted as fact. In 2014, the Bank of England published a bulletin confirming it is its official position. Mervyn King, former Bank of England governor, explains the process – and its dangers – in his 2016 book, The Alchemy of Money. “During the 20th century, governments allowed the creation of money to become the byproduct of the process of credit creation. Most money today is created by private sector institutions – banks. This is the most serious fault-line in the management of money in our societies today,” Baron King writes. Journalistic writers like Felix Martin have also tried their hand at explaining the magic of money creation. In Money: The Unauthorised Biography, first published in 2013, Mr Martin explains that “almost all of [a bank’s] assets are nothing but promises to pay, and almost all its liabilities likewise”. In effect, a deposit at a bank is a promise to pay you, the customer, and a home loan is a promise by you to pay the bank. By balancing when these promises are likely to come due, a bank can effectively create money by juggling all the balls in the air at once. Only a fraction will ever be demanded in cash at any one time, but all of the debts can be used as money. Former Bank of England governor Mervyn King agrees that banks create most of our money – and that it is a problem. Professor Werner is pleased the world is waking up to the truth of how money is created, but is very displeased with what he sees as the central bankers’ reaction: the death of cash and the rise of central bank-controlled digital currency. This will further centralise what he describes as the “already excessive and unaccountable powers” of centrals banks, which he argues has been responsible for the bulk of the more than 100 banking crises and boom-bust cycles in the past half-century. The professor also fears the global push for ‘basic income’, which is being trialled parts of Europe and widely discussed in the media, will form part of the central bankers’ attempt to kill off cash. ‘Basic income’ is a popular idea that can be traced back to Sydney and Beatrice Webb, founders of the London School of Economics. It proposes we abolish all welfare payments and replace them with a single ‘basic income’ that everyone, from billionaires to unemployed single mothers, receives. Either we accept the digital currency issued by central banks, or we miss out on basic income payments. That is Professor Werner’s theory of what might happen. His solution to this “Orwellian” future is decentralisation, in the form of lots of non-profit community banks, as exist in his native Germany. “We need to push for the opposite of this massive and Orwellian increase in centralisation, by decentralising money power. Hence the creation of community banks across countries, operated and controlled locally, accountable to local communities, and not-for-profit. Professor Werner’s predictions have been right before. He invented the term ‘quantitative easing’ in a 1995 paper, in which he argued that struggling economies could boost GDP by using their central banks to relieve commercial banks of their bad debts, thus freeing them to make new loans (i.e. new money). The US followed his definition the closest. The Federal Reserve purchased non-performing assets from banks, and the economy is recovering. Japan and the Eurozone did virtually the opposite. Instead of buying bad debts, their central banks bought corporate bonds and other financial assets. This, he argues, explains why Europe and Japan have remained mired in recession. We can only hope his “Orwellian” prediction of central bank control is less accurate.